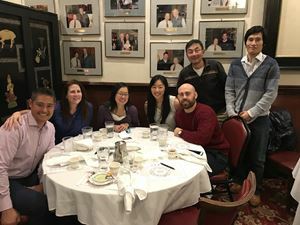 MISSION: To support the Department of the Interior in addressing issues of interest to the DOI Asian American and Pacific Islander (AAPI) community and to foster professional development and networking among its members. PURPOSE: The purpose of this Chapter (FAPAC-DOI) shall be to implement the goals and objectives of the national-level entity Federal Asian Pacific American Council (FAPAC) as set forth in the National bylaws and in accordance with DOI Departmental Policy. 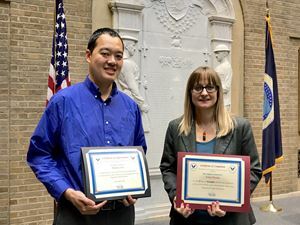 Thomas Liu (BOEM) and Erica Pionke (BLM) from the FAPAC Career Development Mentoring Program graduation on November 9th, 2018. Thomas is the Deputy Regional Director for BOEM Pacific Region. 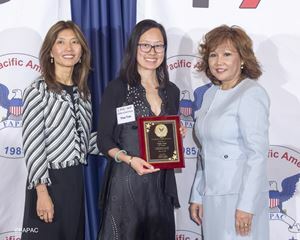 FAPAC-DOI President Thao Tran is presented with the Trailblazer Leadership Award by FAPAC National President Olivia Adrian and Executive Director, White House Initiative on Asian Americans, Holly Ham. Approval Plaque designating FAPAC-DOI as an official chapter of FAPAC. FAPAC-DOI Official Chapter kickoff celebration.